Holy Week, the most important week in the Christian calendar, unfolds like a roller coaster ride. 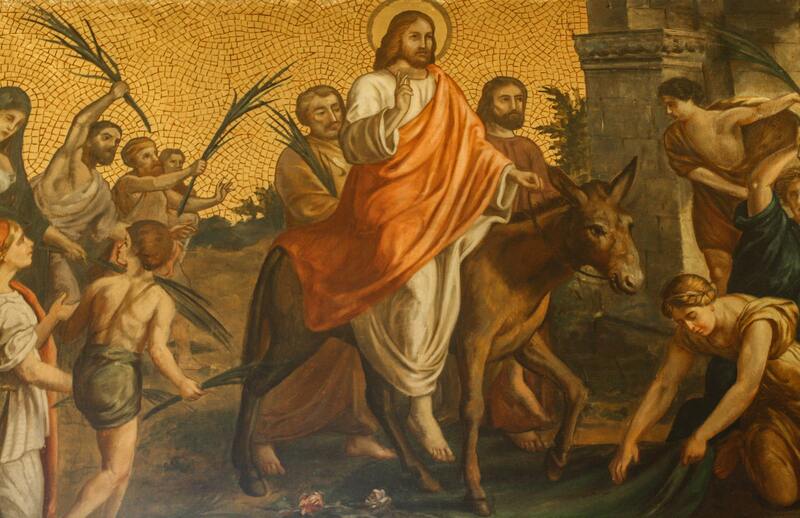 It begins with Palm Sunday, when Jesus arrives in Jerusalem to joyful crowds. The jubilation begins to go south on Holy Thursday, when Jesus celebrates the Last Supper and disquiets the Apostles with fatidic predictions of the quisling Judas’ betrayal and Peter’s denial. Good Friday ends with Jesus’ painful death on a cross and an earthquake. But Easter Sunday restores the joy to His followers. Unlike the wide variety of styles, moods, and emotions in my top five crucifixion scenes, my favorite Palm Sunday scenes are not that dissimilar, either in portrayal or medium. 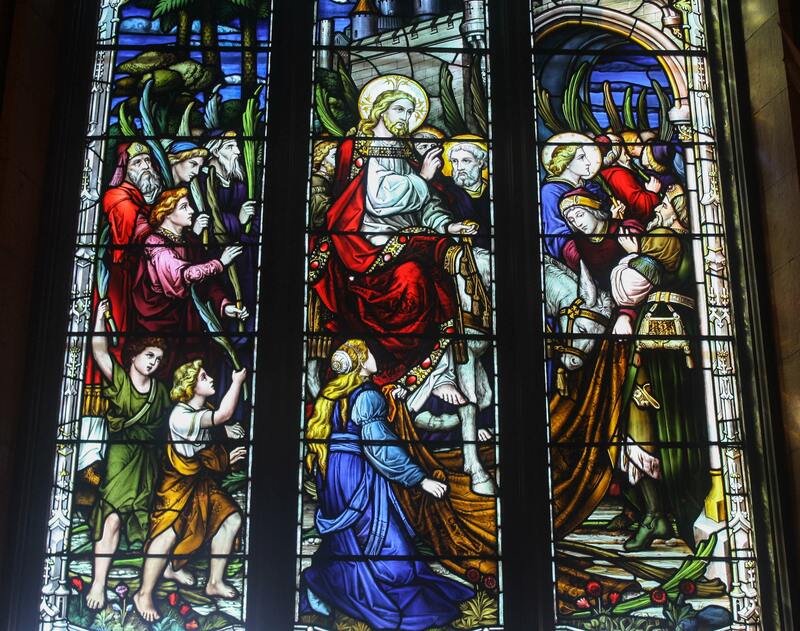 With a couple of exceptions, stained-glass windows seem to render the scene most brilliantly. And they all include pretty much the same elements: an architectural component marking the entry to Jerusalem, palms and cloaks being laid on the road by a crowd, and, of course, Jesus on a donkey — a humbler, more docile beast befitting the king of peace, rather than a horse, an animal more suitable for the arrival of a warrior king. Yet each of the ones I like best contains a little peculiarity or mystery that sets them apart. These are my favorites. Albany’s most beautiful church almost became a wrecking-ball victim during the 1960s, when then New York State Governor Nelson Rockefeller pushed ahead with his ill-conceived Empire State Plaza that razed hundreds of houses nearby, permanently decimating the neighborhood and dislocating the parishioners who had been supporting the church since it was constructed in 1852 and sapping the church’s resources to maintain both the structure and the parish. Good sense, and productive fundraising, prevailed, and now, after a $19 million renovation, the Cathedral of the Immaculate Conception, including the stained-glass windows made in England, has been restored to its former glory. 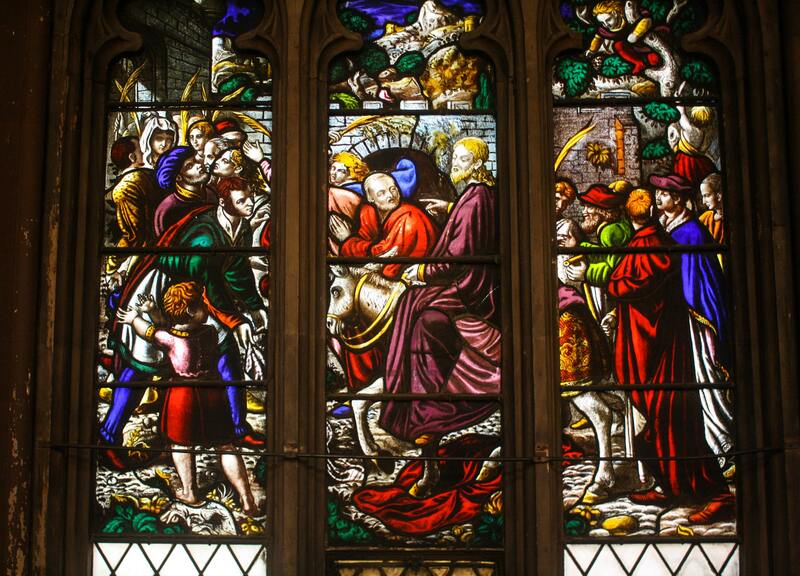 The Palm Sunday window is particularly beautiful and contains all the requisite elements of that moment: Jesus and the donkey, the arched entry to Jerusalem, and cloaks and palms dropped on the road before Him, all created in the full spectrum of colors. Of particular interest is Jesus’ robe: This is no ordinary piece of apparel, but a brilliant red robe trimmed with jewels — the only time I’ve seen Him clad in an ostentatious display. Like Albany’s Cathedral of the Immaculate Conception, Brooklyn’s St. Ann & the Holy Trinity Church faced a pivotal moment: In 1957, in the worst possible way to celebrate its 110th anniversary, the original Holy Trinity parish was dissolved and the church closed, and it remained so for a dozen years. Another parish, St. Ann’s, moved in to the building (hence the dual name) and resurrected some life. Now reopened and declared a National Historic Landmark in 1987, but still undergoing restoration, one of my own neighborhood’s churches boasts the first complete canon of figural stained-glass windows made in North America, created between 1845 and 1848 by the very talented William Jay Bolton with an assist from his brother, John. The window depicting Palm Sunday, awash in deep color, presents a curiosity: A child in the lower-left corner looks up at a very blond Christ on His donkey and extends his arms and open hands to the left, as if to encourage Jesus to go a different way, perhaps knowing that His fate would be sealed once he passed through the arched portal into Jerusalem. Jesus, however, not all at distracted by the motion around him, looks directly at the child and responds by pointing instead toward the route He is destined to travel. After a fire destroyed the existing St. Patrick’s Parish Church, the superintendent priest, Father Baker, developed ambitious plans to construct something much more grandiose. Trading on his influence in the community and his national reputation for charity, Baker, by soliciting donations via a direct-mail fundraising club, managed to construct the basilica at a cost of $3.2 million — without incurring any debt. The massive Our Lady of Victory National Shrine and Basilica boasts 46 different types of marble and, when it was completed in 1926, the second-largest dome in the United States, after the U.S. Capitol. The glorious interior is astounding, and I spent quite a bit of time admiring the outstanding Stations of the Cross and stained-glass windows. But, unlike the vibrancy of the colors in the windows, the Palm Sunday painting, deceptively created to resemble a mosaic, is subtle, with plenty of earth tones keeping it cool and directing my attention to the carrot-colored robe Jesus wears and the deep green of the palm fronds. The figures flanking Him are particularly active, except the man to His left, who could easily pass for His twin. When the construction of Pennsylvania Station and the North River Tunnels under the Hudson River necessitated the demolition of the old Church of St. Michael, a new version was erected just a couple of blocks north and utilized some of the old church’s materials, including its stained-glass windows. 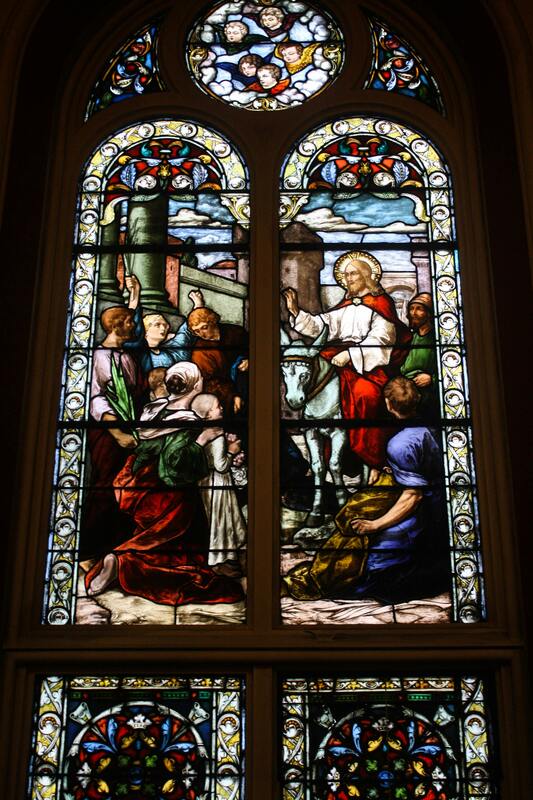 The Palm Sunday window was one of the survivors, and there’s an interesting interplay between two of the figures. On the left, a woman in blue with a yellow head scarf fervidly raises her arms above her head in celebration, one hand holding a palm and her eyes rolling up into her head, as if she is experiencing a religious ecstasy. Jesus, perhaps, knows her. From atop His donkey, He looks directly at her and raises His right hand, not with just two fingers up, as is often the case (see the Cathedral of the Immaculate Conception and Our Lady of Victory National Shrine and Basilica, above), but all five, as if He is simply waving to her. If you didn’t know what you were looking at in this stained-glass window, the creator literally spelled it out for you: “Entry Into Jerusalem” is the textual explanation included in the art. 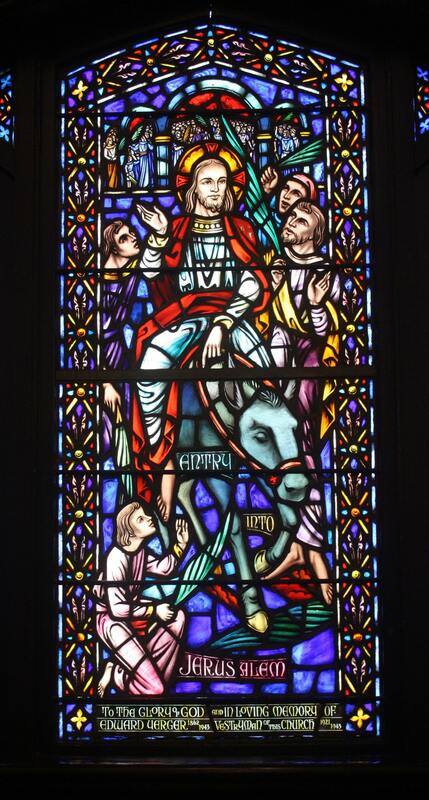 Jesus and the donkey occupy most of the window, and He is flanked by only four other figures, each of whom holds some palm. A closer inspection, however, reveals the throngs: Above and beside His head, robed figures wave palms, becoming increasingly faceless as they recede into the background. When St. Andrew’s Episcopal Cathedral was completed in 1903, the windows were plain amber glass. In the 1950s, the present stained-glass windows replaced them, providing visitors like me with a memorable illustration of this most holy day.